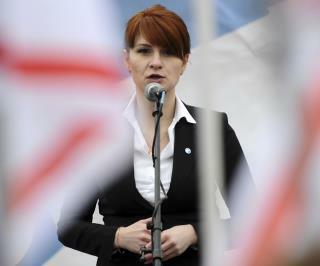 The Anna Chapman reference: The FBI uncovered Twitter communications between Butina and a Russian official identified by NPR and CNN as Alexander Torshin, whom the US sanctioned in April. NPR reports he was allegedly her point of contact within the Russian government. One alleged message from Torshin sent in March 2017: "You have upstaged Anna Chapman. She poses with toy pistols while you are being published with real ones." hey melania already has that job.